Left to Right: Christophe Cudennec (Secretary General, IAHS), Anil Mishra (UNESCO), Hubert Savenije (President, IAHS), Mary Hill (Dooge Medal Recipient), Paul Pilon (WMO). Citation by Hubert Savijne. I thank the nominator Prof. Günter Blöschl for drafting the nomination. Professor Mary C. Hill graduated in Geology from Hope College and received a PhD in Water Resources from the Civil Engineering Department at Princeton University, after which she joined the USGS National Research Program in Denver, Colorado. There she develop a three-pronged research program in groundwater hydrology that included evaluating how measured data related to simulated quantities, developing sensitivity analysis and uncertainty evaluation methods and software to improve transparency and falsifiability of computer simulations, and programming and publishing software to integrate data and models. Her programs and approach have been used extensively throughout the USA. In the last six years, Professor Hill has translated what she learned and developed in groundwater modeling to surface-water rainfall-runoff modeling, which has produced benefits to both fields. Recently, Professor Hill took up a position as full professor in the Geology Department of the University of Kansas, where, she is teaching and developing an interdisciplinary research program on energy and water. 1. Her outstanding contributions to hydrological research, especially in the field of hydrologic modeling, integration of models and data, and evaluation of uncertainty. Mary Hill is a nationally and internationally renowned expert in the field of groundwater modeling. She has made major contributions in the development of methods and guidelines for model calibration and uncertainty analysis as well as advances in how to incorporate different kinds of data into model development for modeling groundwater and other environmental systems. Her contributions to groundwater modeling have not gone unnoticed. In 2000, she received the prestigious Walter L. Huber Civil Engineering Research Prize from the American Society of Civil Engineers. In2001, she was the Distinguished Darcy Lecturer sponsored by the National Ground Water Association. She was elected Fellow of the Geological Society of American in 2003. In 2005, she received the M. King Hubbert Award from the National Ground Water Association. 2. Her development of computer software in support of understanding hydrologic systems, including her role in MODFLOW, the most widely used groundwater flow model in the world. Professor Hill has made her ideas about developing models of environmental systems available in an impressive array of software. She single-handedly developed MODFLOWP for parameter estimation using nonlinear regression for three-dimensional, transient flow. In collaboration with Professor Eileen Poeter and more recently Dr. Dan Lu she developed UCODE, a computer code for universal inverse modeling that can be used on models of any kind of environmental problem. In addition to model analysis software, Professor Hill has made key contributions to many MODFLOW packages and applications. This includes the popular Preconditioned-Conjugate Gradient solver, the Hydrogeologic-Unit Flow Package, and a Local-Grid Refinement version of MODFLOW. She also programmed most of the Observation Process of MODFLOW, which calculated values most commonly needed to compare to observations. 3. Her role in educating young researchers through teaching, advising graduate students at universities in North America and Europe, development and free distribution of educational materials. Already as a federal government researcher Professor Hill was very active in educating young scientists through her teaching of short courses and semester courses, clearly written journal articles, development of software, and writing of her textbook. Throughout her career she has been active in education, always making her teaching materials freely available. Mary is extremely active in professional society activities. She is a founding member of the highly successful MODFLOW and More conference series. She was President of the International Commission for Ground Water (ICGW) of IAHS, where she is known and admired for invigorating the commission by increasing the membership, expanding the two existing conference series (ModelCARE and GQ) to be more international, working with previous ICGW Secretary Dr. Karel Kovar to introduce two new conference series (HydroEco and HydroPredict), and pushing for more involvement in upper level conferences (IAHS Scientific Assemblies and IUGG General Assemblies). In summary, over the last 34 years, Mary Hill has made significant and long lasting contributions to groundwater modeling, particularly in inverse modeling, sensitivity analysis, uncertainty analysis and investigating the importance of existing and new data. This is why it is an honour to award to Dr. Mary Hill the Dooge Medal for outstanding contributions and leadership in hydrological research and modelling. Hubert -- thank you for those very kind words. 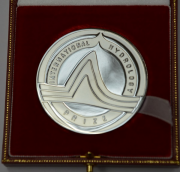 In looking at the list of past recipients of the International Hydrology Prize and reviewing the accomplishments of James Dooge, I am humbled and honored to be receiving this award. This review has made me think of two things that I would like to share with you. First, early on I became fascinated with the potential of what was then the brand new world of computer modeling. I wanted to understand things like how to inform models with data and what measures of uncertainty really mean. At the USGS I worked on this problem using groundwater flow and transport models, taking advantage of the amazing popularity of MODLOW. I also worked with rainfall-runoff models and some geophysical models. Many of these models required, and still require, long run times. Thus, what I now call computationally frugal methods– those that only take 10s of parallelizable model runs – were needed to gain understanding of simulated dynamics. For example, frugal methods were needed to identify important and unimportant parameters in the regional groundwater system surrounding the proposed high level nuclear waste repository at Yucca Mountain. In pursuing these frugal methods I went in a different direction than some of my colleagues. We were all after the same ideals of model transparency and falsifiability, and communication of model results. Yet we struggled with approach and method. I believe this is part of an evolution from what I consider to be the current “Model T stage” of simulating environmental systems. It is sometimes not obvious when one is participating in a revolution. I believe we are now participating in a revolution as computer simulation matures to enable communication of scientific understanding about the world people are creating on Earth. Through this cyber revolution, our choices and their consequences can become more real and immediate. This provides the hope of better decisions and a better future. Discussions like those that occur in this meeting are critical to how this cyber revolution proceeds. The second thing I wanted to share with you comes from my review of James Dooge. James Dooge’s amazing life challenges us scientifically, practically, politically, and legally. These four – science, practicality, politics, and the law -- are inextricably intertwined. Society loses when scientists are disengaged from policy and policy makers. When ignorant of reality, which is discoverable by science, policy often fails and this can lead to unnecessary suffering, strife, and destruction. It is we, the scientists, who have to reach furthest across the communication divide -- to spend time figuring out how to obtain and convey compelling results. James Dooge provided us an example of reaching across that communication divide. The lesson has found fertile soil. Indeed, it has been wonderful to see the effort that so many of the scientists in this room have made in recent years to reach across that divide. Development of the Panta Rhei decade exemplifies this effort. In a small way, I will be following in the footsteps of you and James Dooge next semester as I create a course at the University of Kansas entitled “Water, Energy, Food, the Environment, and Public Policy – Opportunities and Tradeoffs”. In doing this, I look to you, the members of IAHS and IUGG, for information and inspiration. I will especially be thinking of James Dooge. I want to thank all of you for so abundantly providing me with information and inspiration for so many years, in so many ways. 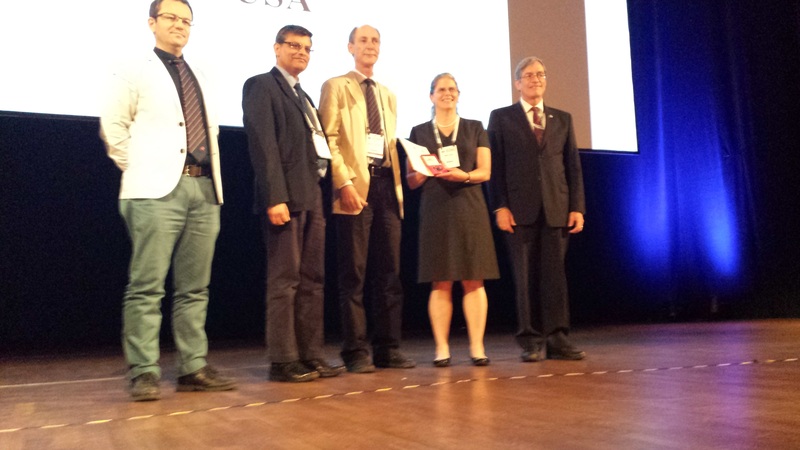 Camaraderie and intellectual challenge are the heart of the IAHS, and these are what make receipt of the International Hydrology Prize so special to me. Finally, I would like to thank my husband, my sister, and other family and friends for providing the love and support that has allowed me to pursue my dreams.